Starting in 1963, with the publication of Twentysix Gasoline Stations, Ruscha began a series of photographic art books that documented ordinary aspects of life in Los Angeles. For Every Building on the Sunset Strip, Ruscha mounted a motorized Nikon to the back of a pick-up truck and photographed every building he passed. The resulting book, with the pictures printed in order and labeled with their street numbers, achieved an effective non-judgemental and almost anthropological record of previously unexplored details and aspects of the urban experience. Ruscha exercised control over each step of the bookmaking process and with the use of inexpensive offset printing, standard paper, and simple, paperback bindings, he created a new genre of art book designed for commercial distributors rather than art galleries. Ruscha's books, which became a staple of Conceptualism, were extremely influential to younger generations of artists. RUSCHA, Edward. Every Building on the Sunset Strip. Los Angeles: Edward Ruscha, 1966. Small quarto, original white wrappers, original silver paper-covered slipcase. $7500. 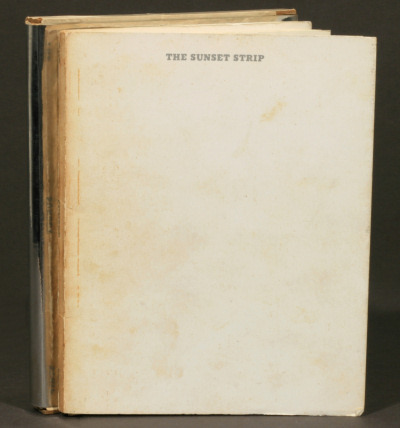 First edition, first issue (with extra folding flap at end) of Edward Ruscha's most famous book; perhaps the greatest example of the new genre of art book that he created. Bound accordion-style as one continuous folding strip extending to 27-feet long. Light soiling to wrappers, darkening and crease to spine; slipcase with slight edgewear. With stamp of the American distributor, Wittenborn and Company, on title. An outstanding copy of a rare and fragile book.